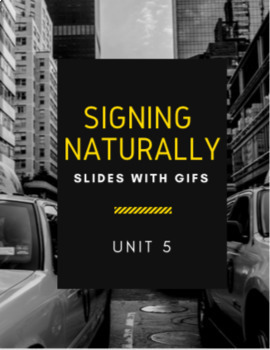 This includes PowerPoints (with gifs of the signs) from Signing Naturally Units 1 - 5! Every. One. 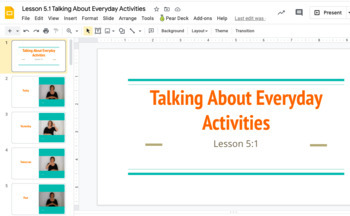 55 slide shows (with the gifs already embedded) that you do not have to make yourself!Post these to your class website, send to a student who was absent, use as a warm up or exit slip and more! 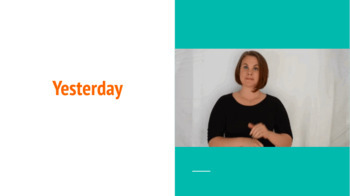 Signing Naturally - ASL 1 BUNDLE - Gifs and PowerPoints with gifs! This is everything you need for ASL 1! All the gifs (over 780!) and PowerPoints (55!) already done! 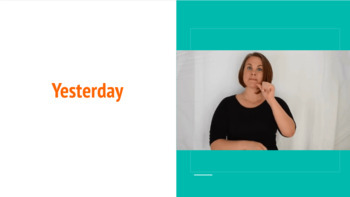 Teaching ASL is hard enough! Doesn't it feel like there are barely any resources out there to make our lives just a little bit easier? We put so much time and energy into a beautiful lesson, and then a student is absent and misses new signs! We all know that dreaded "what did I miss yesterday?" question. This is an easy way to get students caught up when they miss class and you simply do not have enough hours in the day reteach material to every kid that was absent. This folder contains a separate powerpoint for each lesson. Power Points include all of the vocabulary with gifs of the signs. Share on your class website, google classroom, remind, or even use a quick review or warmup!